Nobody does high-tech couture quite like CuteCircuit can. 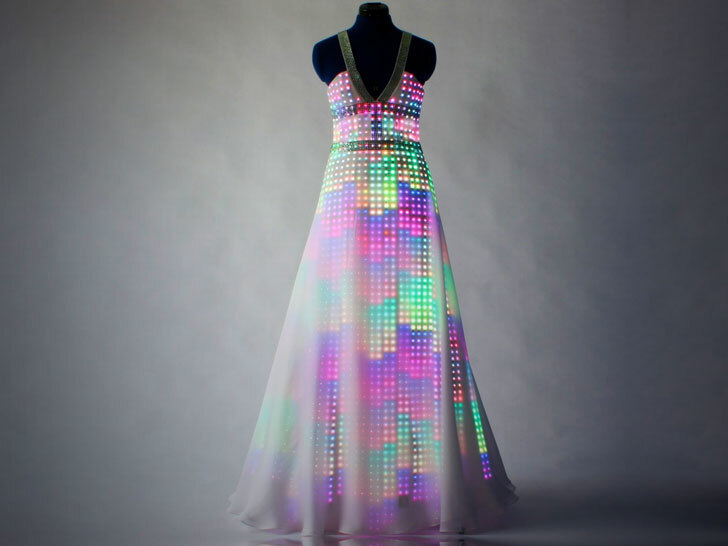 After bringing us the world’s largest wearable display in 2009, the London-based atelier dressed a young opera singer in a hypnotic gown powered by 10,000 embroidered LEDs. The pulsating silk-chiffon number, which debuted at a private event hosted by Breitling, features hundreds of Swarovski crystals in a kinetic landscape of pattern and color. The overall effect brings to mind the aurora borealis (or northern lights) phenomenon, as well as Aurora, the Roman goddess of dawn who flies across the sky each morning to herald the arrival of the sun. Francesca Rosella and Ryan Genz, who founded CuteCircuit, calls the “Aurora” one of the most representative piece of their burgeoning haute couture collection. All of the label’s garments are designed in London and manufactured in the United Kingdom, United States, or Italy using 100 percent Restriction of Hazardous Substances-compliant technology and Oeko-Tex-certified textiles. CuteCircuit calls the “Aurora” one of the most representative piece of its haute couture collection. Other pieces in CuteCircuit’s bespoke line include a bedazzled skintight catsuit for Katy Perry and an LED-embellished frock that streams real-time video. CuteCircuit also invented a little black dress that doubles as a cellphone. Nobody does high-tech couture quite like CuteCircuit can. After bringing us the world's largest wearable display in 2009, the London-based atelier dressed a young opera singer in a hypnotic gown powered by 10,000 embroidered LEDs. The pulsating silk-chiffon number, which debuted at a private event hosted by Breitling, features hundreds of Swarovski crystals in a kinetic landscape of pattern and color. The overall effect brings to mind the aurora borealis (or northern lights) phenomenon, as well as Aurora, the Roman goddess of dawn who flies across the sky each morning to herald the arrival of the sun.